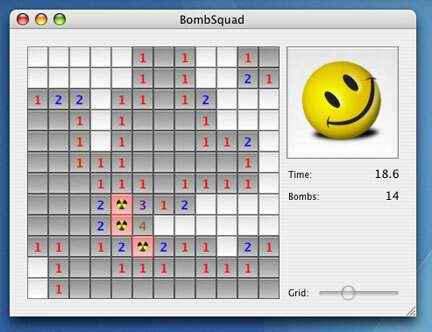 The Aqua-licious minesweeper clone for Mac OS X.
OK, so it looks like minesweeper. The playing field is on the left, and on the right is the "big button". You can adjust the size of the playing field by dragging the lower right corner of the window, and change the size of the grid by adjusting the slider in the lower right. In my opinion, it's the best looking minesweeper out there (but I am biased, of course). Download and judge for yourself!